How long would you live in a house or apartment that had water pouring out of its pipes? Then why would you ever allow a business to continue to operate when products, features, and new ideas “leak out” and are not able to flow from your engineering/IT teams to the Marketing department and on to the Sales department? Gone are the days in which a magic oracle in the company would accurately pick the “next big thing” and then everyone would have a couple of years to design, develop, and deliver that product. Instead, we now live in a quarter-by- quarter world in which you can’t afford to have ALL of your best ideas not make it to market. You have a great team of technical professionals, Marketing staff, and Sales teams, but they have been taught to work only within their departments. In the past, they were either responsible for shoving the next product out the door or simply waiting for the next great idea to be handed to them. Those days are gone. You need to find a way to get them to work together as a single, seamlessly functioning team that takes responsibility for each product from start to finish. At the same time you need to find a way to do this while keeping in place each department’s established ways of motivating their own employees. This unique program from Blue Elephant Consulting has been designed with your IT, Marketing, and Sales teams’ special needs in mind. This is not a rah-rah session that will get your teams motivated for the moment and then send them back to do business as usual. Instead, this program drives right to the heart of the problem: your teams need each other in order to both survive and prosper. We’ll tackle that problem first and then we move on to dealing with creating a specific grass-roots plan for how the different teams can work together with a special focus on what’s in it for them if they do. The combination of insights and tools presented in this program will equip your IT, Marketing, and Sales teams with the practical skills that they will need in order to create an efficient pipeline that will deliver new products and services from start to finish. 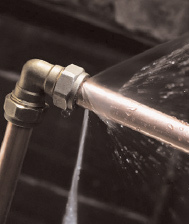 Three Reasons That Your Pipes Start To “Leak”. Is It Time To Call A Plumber Or Try To Fix It Yourself? This material can be presented in multiple formats that can be further customized to meet your event’s needs: keynote (30/45/60 minutes), breakout session (30/45/60 minutes), interactive group dialog (60 minutes) or as a full or half day workshop. Contact Blue Elephant Consulting today for a free consultation call in order to find out how our training services can help to make your IT department more effective.